Viking of Norway has existed since January 2007 and they have their headquarter at Oltedal in Rogaland where they sit in large, beautiful, traditional textile rooms from 1908. The name Viking of Norway relates to an old, local viking story. The battle of Hafrsfjord is a big part of Norway’s history and was fought between Harald Hårfager and other kings. The battle is seen as the definitive fight in Harald Hårfager’s unification of the land of the West and thereby also Norway. Viking of Norway consists of many key persons with many years of experience within textile production, product development and Norwegian design. Viking of Norway was the first Norwegian company that launched the popular and incredibly soft milk yarn. 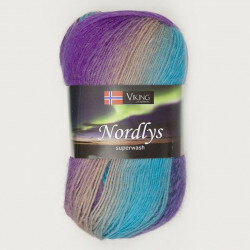 Viking yarn is often used by us in the Nordic countries since it is available in various kinds of wool (Merino wool, Alpaca, Australian wool etc.). Thus, it is especially great for the Nordic climate since it provides us with a lot of warmth and protects us against the cold. 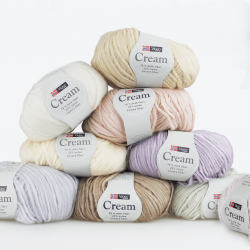 Yarn from Viking also includes the amazing milk yarn, which is soft as cotton-wool, and has the same qualities as silk and wool. Furthermore, it is also claimed that milk yarn has a healing effect on the skin, so it is especially useful for people with allergies and babies. Milk yarn from Viking is available in many fabulous, natural colors, so there is a good opportunity to crochet or knit a pretty blouse for summer or winter, since milk yarn also has a cooling effect when it is hot, just as it warms you when it is cold. Here at Hobbii, you can also get sock yarn from Viking which provides you with the best conditions to knit fabulous socks, which without a doubt will please the one who receives them. The sock yarn is available in many colors which will feed your imagination. 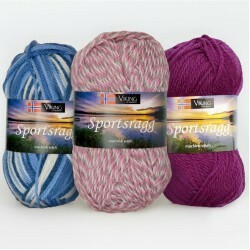 Last, but not least, we also offer sport yarn which is used for knitting woolen sport socks which are very useable. This yarn can also be used for crocheting or knitting mittens, sweaters, cardigans or clothing alike. Here at Hobbii, we strive to be some of the best and the fastest at delivering Viking yarn and yarn supplies. Thus, you always receive your goods no later than 3 weekdays after you placed your order online. We take great pride in having a high standard customer service and you can always call us, if you have any questions regarding some of our products. We always provide you with a full refund on goods ordered via our online shop. You are always welcome to contact us, if you have any questions regarding our Viking yarn, or if you need help with ordering. You can contact us via our contact form, and we will answer you as quickly as possible. We are looking forward to welcoming you as a customer. It is one of my favourite yarns for hat making! It's quite dense and the colours are great! So vivid! They never disappoint me! The change of colour happens gradually in smooth grading. Perfect for 3 mm (even 3.5mm) crochet hooks. Sometimes it gets slightly thicker when the new colour is starting, but it really is a minor difference, not affecting my knitting at all. Really nice colours, going to make a cute hat!